This post originally appeared on the SC Writers’ Association Columbia II Chapter blog. I love talk radio. Like writing, my passion for talk radio is about storytelling and craft. I’m interested in the way a host can move through topics, keep people listening, and slide in-and-out of commercial breaks with poise. Like launch a radio show all about books. Make the Point Radio at 100.7 on the FM dial in Columbia, S.C. is a local radio station that showcases local people. With that in mind, programming includes local experts every day from 9 until 10 a.m. On Tuesdays the local experts are entrepreneurs on a show called Start Something, Columbia! When I started Start Something, Columbia! I meant for it to complement 1 Million Cups, the Wednesday 9 a.m. meet-up at the Richland Library for business owners. 1MC was doing a great job of building its crowd but not a great job of educating the people who showed up. Start Something, Columbia! is like a book club for entrepreneurs. Each month we focus on a new text and bring in subject matter experts to discuss various entrepreneurial topics with the text as the foundation for the discussion. While discussing the format with some friends at the Richland Library, we wondered whether a radio book club could work. I took the concept of Write On SCto the station owner, Keven Cohen, and he loved the idea of having local authors showcased on the radio. I set up a Patreon page to raise money for the venture and encouraged my SCWA chapter’s published authors to consider advertising their work on the show. The show’s format is simple. Each week we’ll discuss a new writing craft topic – things like dialogue, setting, character development – and have a guest writer on the show to promote his or her work. We’ll also feature a weekly read as selected by the Richland Library staff and some Book Marketing Tips for self-published and self-promoting authors as well. As a novice fiction writer (I don’t have any published books but have published some short stories) and professional content creator (my company Clemson Road Creative is producing the show), I bring a specific expertise to show development. I’ve delivered workshops for conferences like Winter Wheat Festival at Bowling Green State University and the SC Book Festival. This Fall, I’m speaking at the Pat Conroy 2ndAnnual Lowcountry Book Club Convention. 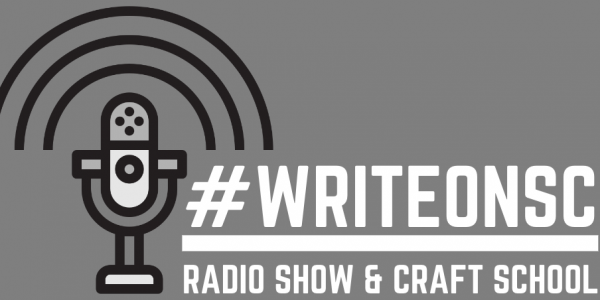 Write On SCguest hosts will all contribute their craft and industry expertise while promoting their own work. Our discussion of writing fundamentals and industry tricks should serve as weekly workshops on writing. The live show will also become a podcast after we’ve accumulated 6 episodes. I hope Write On SC will fill a gap in South Carolina’s writing scene. We lack a unifying platform for writers of all levels. To learn more or participate visit patreon.com/WriteOnSC. Previous Post Episode 1: Planner or Pantser?